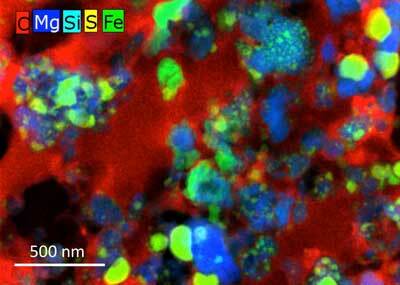 (Nanowerk News) A team of scientists led by University of Hawai'i at Manoa (UH M?noa) School of Ocean and Earth Science and Technology (SOEST) researcher Hope Ishii, discovered that certain interplanetary dust particles (IDPs) contain dust leftover from the initial formation of the solar system (PNAS, "Multiple generations of grain aggregation in different environments preceded solar system body formation"). The initial solids from which the solar system formed consisted almost entirely of amorphous silicate, carbon and ices. This dust was mostly destroyed and reworked by processes that led to the formation of planets. Surviving samples of pre-solar dust are most likely to be preserved in comets--small, cold bodies that formed in the outer solar nebula. In a relatively obscure class of IDPs believed to originate from comets, there are tiny glassy grains called GEMS, or glass embedded with metal and sulfides--typically only tens to hundreds of nanometers in diameter, less than 1/100th the thickness of human hair. "Our observations suggest that these exotic grains represent surviving pre-solar interstellar dust that formed the very building blocks of planets and stars," said Ishii, who is based at the UH Manoa Hawai'i Institute of Geophysics and Planetology. "If we have at our fingertips the starting materials of planet formation from 4.6 billion years ago, that is thrilling and makes possible a deeper understanding of the processes that formed and have since altered them." The University of Hawai'i has a strong footprint in space science and state-of-the-art instrumentation and is recognized as world-class in this field. "This is an example of research that seeks to satisfy the human urge to understand our world's origins and serves the people of Hawai'i by boosting our reputation for excellence in space science and as a training ground for our students to be engaged in exciting science," said Ishii. In the future, the team plans to search the interiors of additional comet dust particles, especially those that were well-protected during their passage through the Earth's atmosphere, to increase understanding of the distribution of carbon within GEMS and the size distributions of GEMS subgrains.